It seems that although people first used the Rowden surname in England during the 15th century, give or take a hundred years, they did not always stay put. Certainly some migrated as early as the 18th century. 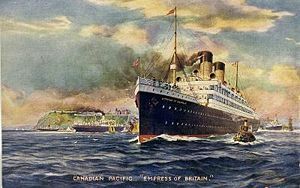 However during the 19th century many departed the shores of England leaving from her major ports, London, Liverpool, Southampton and Plymouth to chase dreams of a better life in another world. 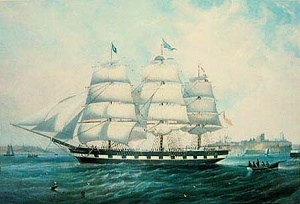 Departures from England in the early 1800s were likely to have been on a sailing vessel similar to the one pictured here. Journeys to Australia and New Zealand were an ordeal in themselves and some either did not make it or perished shortly after arrival. People left with great promise but wherever the point of arrival in the 'new world', conditions were usually poorer than the point of departure. Set out below is a list of Rowdens who left England not expecting to return, in order by migration year. Some were sailors who never quite made it back home. One or two did return permanently and a few returned on visits but most stayed in their new country. You will note that some migrated from their chosen country to another later in life. The list below shows either an indiviual who migrated or the head of the family who left en masse.